ImageRugs™ is the #1 provider of quality rugs and carpets for homes and businesses. But more than just selling rugs, we are a team of dedicated and passionate rug specialists who have been taking a different approach to rugs for over 90 years. Don’t take our word for it, check out our customer testimonials. 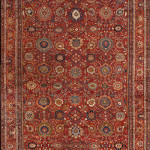 Originally Khaledi Oriental Rugs, ImageRugs is a family owned business founded by our grandfather in 1910. With his passion and motivation, he became a legendary antique and modern rug dealer in many areas including Iran, Europe and throughout the Middle Eastern region. Today, we hold his title by maintaining his passion and standards for quality rugs, and dedication to our customers. ImageRugs puts everything aside to focus on what is best for their client.